With over a month of the NBA season complete, the top of the league is a crowded. The usual Western Conference powerhouses, San Antonio, Phoenix, and Dallas, are all up there, but the Eastern Conference is finally making some noise. Detroit is good as always, but Boston and Orlando have burst on to the scene as title contenders. Orlando cente r Dwight Howard has become one of, if not the best, big man in the NBA. He averages 23 points and 15 rebounds per game, and his supporting players have picked up their play as well. Rashard Lewis is averaging 18 points per game and Jameer Nelson is averaging 12 points and 6 assists. After a 40-42 season last year, Orlando has jumped out to a 18-10 record this year and is poised to make a run at an Eastern Conference title. The reason for Boston’s success is a mystery to no one. 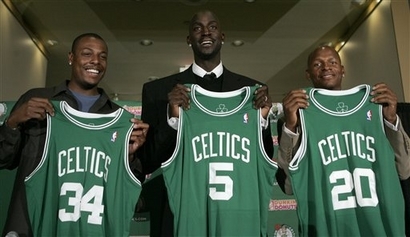 The “Big 3”, Paul Pierce, Kevin Garnett, and Ray Allen, have been nothing short of spectacular. Garnett became the team leader immediately and made the Celtics the best defensive team in the NBA. Young point guard Rajon Rondo has played well and Glen “Big Baby” Davis, after starting the season getting only a minute or two per game, has played well enough to get some serious minutes. In the most-anticipated game so far this year, the Pistons defeated the Celtics by 2 points, proving that the Pistons still owned the East. Chauncey Billups carried the load and made to clutch free throws with .1 seconds left to get the victory. Rip Hamilton added 21 points and Rasheed Wallace had 13 rebounds. Neither team played particularly well though with Tayshaun Prince adding only 2 points for the Pistons while Pierce was only 5-16 for 11 points for the Celtics. Though Orlando has played exceptionally this season, the Pistons and Celtics have run through their opponents easily and I believe they will they meet in the Eastern Conference Finals. The Western Conference is a different story, where normal powerhouses are continuing their dominance. Though seeming lackluster at times, the Phoenix Suns are off to an 18-8 start and lead the Pacific division by two games. Nash is having another MVP caliber season averaging over 17 points and 21 assists per game. San Antonio and Dallas are separated by only a 1/2 game in the Southwest Conference with the edge going to the Spurs. Tony Parker’s 20 points and 7 assists per game and Tim Duncan’s 18 points and 9 rebounds per game have fueled the Spurs to an 18-7 record. In Dallas, Dirk Nowitzki is averaging 22 points, 8 rebounds, and 4 assists per game. With 14 points and 5.5 assists per game, Devin Harris is complimenting Nowitzki perfectly, leading the Mavericks to a 19-9 record. These three teams have been dueling it out the last couple years and I believe Dallas will once again fall short as the Suns and Spurs will meet in the Western Conference finals again. Though it is early in the season, those six teams have separated themselves from the rest of the league. Each week I will post my top six teams in the NBA Page of my blog. This week’s top six are listed both below and on that page.